Silica is the main mineral on earth and many people are occupationally exposed to it in several industries, such as mine, foundry, ceramic tile factories, production of washing powder and cleaners, brick, production of various chemicals and glazed ceramic tiles, different types of crystals, pharmacy, sand blasting, and ferrosilicon [1Raju B, Rom WN. Silica, some silicates, coal dust and para-aramid fibrils. IARC monographs on the evaluation of carcinogenic risks to humans, vol. 68. Cancer Causes Control 1998; 9(3): 351-3. [http://dx.doi.org/10.1023/A:1011242002145] ]. International Agency for Research on Cancer (IARC) has introduced crystalline silica as a human carcinogen in 1997 [1Raju B, Rom WN. Silica, some silicates, coal dust and para-aramid fibrils. IARC monographs on the evaluation of carcinogenic risks to humans, vol. 68. Cancer Causes Control 1998; 9(3): 351-3. [http://dx.doi.org/10.1023/A:1011242002145] ]. Various studies have been carried out in this field. Several studies evaluate the relationship between diseases and previous exposure with crystalline silica [2Kurihara N, Wada O. Silicosis and smoking strongly increase lung cancer risk in silica-exposed workers. Ind Health 2004; 42(3): 303-14. [http://dx.doi.org/10.2486/indhealth.42.303] [PMID: 15295901] -6Cocco P, Dosemeci M, Rice C. Lung cancer among silica-exposed workers: The quest for truth between chance and necessity. Med Lav 2007; 98(1): 3-17. [PMID: 17240640] ]. Some toxicological studies were carried out to evaluate health risks of exposure to crystalline silica on human beings [7Halder A, De M. Increase in DNA damage in lymphocytes and micronucleus frequency in buccal cells in silica-exposed workers. Indian J Occup Environ Med 2012; 16(1): 34-7. [http://dx.doi.org/10.4103/0019-5278.99691] [PMID: 23112505] ] and animals [8Seiler F, Rehn B, Rehn S, Bruch J. Different toxic, fibrogenic and mutagenic effects of four commercial quartz flours in the rat lung. Int J Hyg Environ Health 2004; 207(2): 115-24. [http://dx.doi.org/10.1078/1438-4639-00275] [PMID: 15031954] -10van Berlo D, Wessels A, Boots AW, et al. Neutrophil-derived ROS contribute to oxidative DNA damage induction by quartz particles. Free Radic Biol Med 2010; 49(11): 1685-93. [http://dx.doi.org/10.1016/j.freeradbiomed.2010.08.031] [PMID: 2082 8610] ]. Nowadays, it is generally confirmed that biological responses caused by exposure to crystalline silica are under the influence of inherent properties of silica dust and physic-chemical changes. Investigating the effects of silica on genetic content of cells is a new field of research which has been highly focused on in the recent years. In a study by Demircigil et al., on nasal cells and workers’ lymphocytes, it is indicated that dust can form micronucleus (MN) in direct nasal and indirect lymphocyte exposures [11Demircigil GC, Coskun E, Vidinli N, et al. Increased micronucleus frequencies in surrogate and target cells from workers exposed to crystalline silica-containing dust. Mutagenesis 2010; 25(2): 163-9. [http://dx.doi.org/10.1093/mutage/gep057] [PMID: 19939883] ]. Average concentrations of dust particles in the studied groups. MN formation is one of the symptoms of chromosomal aberrations which can be evaluated in low costs and limited facilities and is used to determine chromosomal aberrations due to different physical and chemical factors [12Hayashi M, Norppa H, Sofuni T, Ishidate M Jr. Mouse bone marrow micronucleus test using flow cytometry. Mutagenesis 1992; 7(4): 251-6. [http://dx.doi.org/10.1093/mutage/7.4.251] [PMID: 1381458] , 13Abrevaya XC, Carballo MA, Mudry MD. The bone marrow micronucleus test and metronidazole genotoxicity in different strains of mice (Mus musculus). Genet Mol Biol 2007; 30(4): 1139-43. [http://dx.doi.org/10.1590/S1415-47572007000600018] ]. Different chemical, physical, and biological factors in living and working environments, such as genotoxic factors, may lead to MN formation [5Ulm K, Gerein P, Eigenthaler J, Schmidt S, Ehnes H. Silica, silicosis and lung-cancer: Results from a cohort study in the stone and quarry industry. Int Arch Occup Environ Health 2004; 77(5): 313-8. [http://dx.doi.org/10.1007/s00420-004-0513-6] [PMID: 15156325] -10van Berlo D, Wessels A, Boots AW, et al. Neutrophil-derived ROS contribute to oxidative DNA damage induction by quartz particles. Free Radic Biol Med 2010; 49(11): 1685-93. [http://dx.doi.org/10.1016/j.freeradbiomed.2010.08.031] [PMID: 2082 8610] ]. Other factors, including temperature above 39oC form MN in sensitive cells [14Asanami S, Shimono K. High body temperature induces micronuclei in mouse bone marrow. Mutat Res 1997; 390(1-2): 79-83. [http://dx.doi.org/10.1016/S0165-1218(97)00002-5] [PMID: 9150755] ]. In vitro exposure of human lymphocyte cells with free silica may form more MN in these cells [15Wang JJ, Sanderson BJ, Wang H. Cytotoxicity and genotoxicity of ultrafine crystalline SiO2 particulate in cultured human lymphoblastoid cells. Environ Mol Mutagen 2007; 48(2): 151-7. [http://dx.doi.org/10.1002/em.20287] [PMID: 17285640] ]. In a study on the effects of amorphous silica nanoparticles, it is indicated that silica nanoparticles form MN [16Park MV, Verharen HW, Zwart E, et al. Genotoxicity evaluation of amorphous silica nanoparticles of different sizes using the micronucleus and the plasmid lacZ gene mutation assay. Nanotoxicology 2011; 5(2): 168-81. [http://dx.doi.org/10.3109/17435390.2010.506016] [PMID: 20735203] ]. The studies which have been carried out on crystalline silica at the concentration of 120 mg/ml were cultured on lymphocytes for 24 hours leading to formation of MN; however, no significant difference was observed in their DNA fragmentation with comet assay [15Wang JJ, Sanderson BJ, Wang H. Cytotoxicity and genotoxicity of ultrafine crystalline SiO2 particulate in cultured human lymphoblastoid cells. Environ Mol Mutagen 2007; 48(2): 151-7. [http://dx.doi.org/10.1002/em.20287] [PMID: 17285640] ]. Multiple studies indicated that amorphous silica has no genetic and MN complications [17Lin Y-S, Tsai C-P, Huang H-Y, Kuo C-T, Hung Y, Huang D-M, et al. Well-ordered mesoporous silica nanoparticles as cell markers. Chem Mater 2005; 17(18): 4570-3. [http://dx.doi.org/10.1021/cm051014c] -21Slowing I, Trewyn BG, Lin VS-Y. Effect of surface functionalization of MCM-41-type mesoporous silica nanoparticles on the endocytosis by human cancer cells. J Am Chem Soc 2006; 128(46): 14792-3. [http://dx.doi.org/10.1021/ja0645943] [PMID: 17105274] ]. In a study by Brown et al., two rod and spherical forms of amorphous silica were compared and no significant difference was observed in their silica complications [22Brown SC, Kamal M, Nasreen N, Baumuratov A, Sharma P, Antony VB, et al. Influence of shape, adhension and simulated lung mechanics on amorphous silica nanoparticle toxicity. Adv Powder Technol 2007; 18(1): 69-79. [http://dx.doi.org/10.1163/156855207779768214] ]. 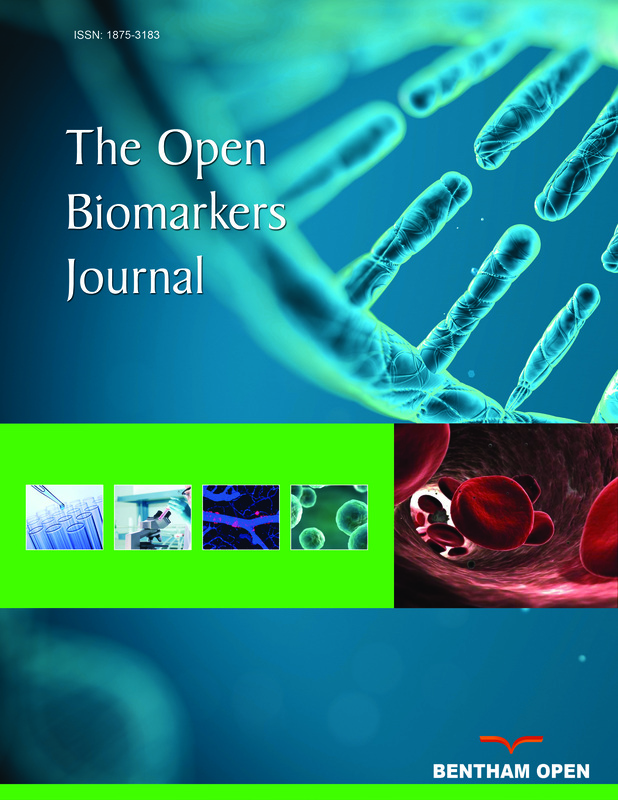 The main role of the effect biomarkers is to obtain early signs of disease and prevent the development of irreversible results, such as the risk of occupational carcinogens using genotoxicity assays [11Demircigil GC, Coskun E, Vidinli N, et al. Increased micronucleus frequencies in surrogate and target cells from workers exposed to crystalline silica-containing dust. Mutagenesis 2010; 25(2): 163-9. [http://dx.doi.org/10.1093/mutage/gep057] [PMID: 19939883] ]. So far, no valid biomarker has been recommended for early diagnosis and measurements of progression of silicosis [23Tiwari R. Biomarkers of silicosis: Potential candidates. Indian J Occup Environ Med 2005; 9(3): 103., 24Huaux F. New developments in the understanding of immunology in silicosis. Curr Opin Allergy Clin Immunol 2007; 7(2): 168-73. [http://dx.doi.org/10.1097/ACI.0b013e32802bf8a5] [PMID: 1735 1471] ]. Based on the results of previous studies, MN formation can be regarded as a symptom of chromosomal damage by chemical agents such as crystalline silica [12Hayashi M, Norppa H, Sofuni T, Ishidate M Jr. Mouse bone marrow micronucleus test using flow cytometry. Mutagenesis 1992; 7(4): 251-6. [http://dx.doi.org/10.1093/mutage/7.4.251] [PMID: 1381458] , 13Abrevaya XC, Carballo MA, Mudry MD. The bone marrow micronucleus test and metronidazole genotoxicity in different strains of mice (Mus musculus). Genet Mol Biol 2007; 30(4): 1139-43. [http://dx.doi.org/10.1590/S1415-47572007000600018] ]. In relation to exposure to crystalline silica dust, there is a need for biomarkers to predict the possibility of silicosis and the development of lung cancer. Advantages of using primary biomarkers from biological effects in etiology studies are that people may be likely less to evaluate the outcome of the disease than cohort studies [11Demircigil GC, Coskun E, Vidinli N, et al. Increased micronucleus frequencies in surrogate and target cells from workers exposed to crystalline silica-containing dust. Mutagenesis 2010; 25(2): 163-9. [http://dx.doi.org/10.1093/mutage/gep057] [PMID: 19939883] ]. This study aims to evaluate the rate of MN formation in mouse lymphocytes due to exposure to silica dust. Average changes of MN in mouse lymphocytes of studied groups exposed to silica dust are shown in Table 2. Among the exposure groups, the highest rate of MN formation was in the first group and in the fourth month of exposure. 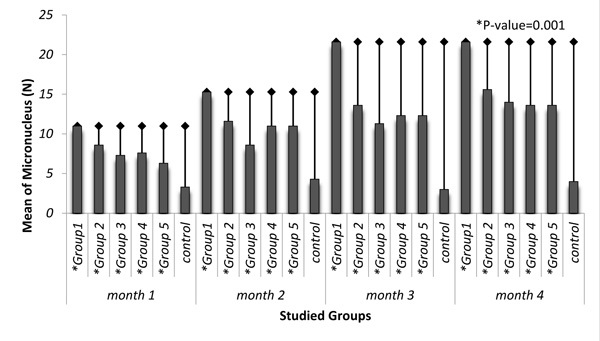 The average number of formed MN in all groups was statistically significant in each month of exposure in comparison to the control group (P=0.001) (Fig. 1 ). In the control group, the highest changes of MN were observed in the second month and there was no significant difference between the months of measurement (P>0.05). Average changes of MN in mouse lymphocytes exposed to silica dust. Correlation between concentrations of exposure to silica dust with average of MN formation in exposure groups. The rate of MN formation in mice exposed to silica dust. Exposure to silica can occur in occupational and industrial environments due to its abundance in earth crust. Silica is widely used in industries and may cause different damages in human body. Recent studies have shown that when silica dust reaches the original lung tissue, they are phagocytosed by lung macrophages; this activates the production of Reactive Oxygen Species (ROS). ROS can cause damage to cell membranes and genetic structures of various organs of the body, especially the lung [25Syslová K, Kačer P, Kuzma M, et al. LC-ESI-MS/MS method for oxidative stress multimarker screening in the exhaled breath condensate of asbestosis/silicosis patients. J Breath Res 2010; 4(1): 017104. [http://dx.doi.org/10.1088/1752-7155/4/1/017104] [PMID: 21386209] , 26Yao SQ, Rojanasakul LW, Chen ZY, et al. Fas/FasL pathway-mediated alveolar macrophage apoptosis involved in human silicosis. Apoptosis 2011; 16(12): 1195-204. [http://dx.doi.org/10.1007/s10495-011-0647-4] [PMID: 21910009] ]. The results of this study indicate that dust concentration and exposure time increase the MN formation. There was a direct and significant correlation between the concentration of silica dust and duration of exposure in the exposure groups with the average number of formed MN (P=0.001). Maximum rate of MN formation was observed in the fourth month and in group one which was exposed to higher concentrations than the rest of the groups; minimum MN formation was observed in group 5 and in the first month, furthermore, rate of MN formation was significantly different in all exposure groups in comparison with control groups. Bonassi et al., conducted a study on the frequency of MN of peripheral blood lymphocytes in order to predict cancer risk in which the frequency of MN of peripheral blood lymphocytes was used as a biomarker of chromosomal aberrations in human populations. Their reported results indicated that the frequency of MN in peripheral blood lymphocytes can be a predictor of cancer risk among healthy people [27Bonassi S, Znaor A, Ceppi M, et al. An increased micronucleus frequency in peripheral blood lymphocytes predicts the risk of cancer in humans. Carcinogenesis 2007; 28(3): 625-31. [http://dx.doi.org/10.1093/carcin/bgl177] [PMID: 16973674] ]. In a study on workers exposed to crystalline silica dust in Turkey, MN test was performed in peripheral blood lymphocytes and in nasal epithelial cells as a target organ in the respiratory tract. The results indicated that the frequency of MN in lymphocytes was two times more, and in nasal cells three times more than people with exposure background to dust [11Demircigil GC, Coskun E, Vidinli N, et al. Increased micronucleus frequencies in surrogate and target cells from workers exposed to crystalline silica-containing dust. Mutagenesis 2010; 25(2): 163-9. [http://dx.doi.org/10.1093/mutage/gep057] [PMID: 19939883] ]. Based on the results, it can be said that the frequency of MN in blood cells is positively associated with exposure time and is an indicator of cumulative genetic damage due to exposure to crystalline silica. In a study in India on the workers of pottery industry who were in chronic exposure to silica, MN frequency and chromosomal aberrations in peripheral blood lymphocytes were two times more than the control group. Furthermore, the rate of chromosomal aberrations in lymphocytes was significantly high. In some workers, respiratory disorders were observed, and risk of increased mutagenic risk in pottery workers exposed to silica dust was reported to be high [28Balamuralikrishnan B, Balachandar V, Subramaniam MD, Alagumuthu KK, Sureshkumar S, Arun M. Assessment of genotoxic and humoral immune system alterations in silica exposed workers from pottery industries in South India. Stochastic Environ Res Risk Assess 2014; 28(7): 1801-14. [http://dx.doi.org/10.1007/s00477-013-0843-6] ]. In another study in India on construction workers who were in long-term exposure to silica-contained clay dust, a significant increase was observed in MN of blood leucocytes and comet tail length in comparison with the control group. The reported results of this study indicated that long-term occupational exposure to clay during constructions may increase DNA aberrations and hinder their repair [29Sellappa S, Prathyumnan S, Balachandar V. DNA damage induction and repair inhibition among building construction workers in South India. Asian Pac J Cancer Prev 2010; 11(4): 875-80. [PMID: 21133594] ]. In a study on tunnel construction workers of Italy who were exposed to a combination of chemical material including silica and stone dust, gases, asbestos, and diesel exhaust compared with outdoor areas workers in the same working area. Primary DNA aberration, Sister-Chromatid Exchanges (SCE), and MN of peripheral blood cells were measured. No significant difference was observed in primary DNA aberration and SCE frequency of tunnel workers and control group, while MN had significantly increased in exposure group in comparison with the control group. Since MN in peripheral blood lymphocytes is known as a predictor of cancer risk in the population with healthy people, genotoxic risk may be caused from occupational exposure to different peripheral pollutions during tunnel construction [30Villarini M, Moretti M, Fatigoni C, et al. Evaluation of primary DNA damage, cytogenetic biomarkers and genetic polymorphisms for CYP1A1 and GSTM1 in road tunnel construction workers. J Toxicol Environ Health A 2008; 71(21): 1430-9. [http://dx.doi.org/10.1080/15287390802328580] [PMID: 18800292] ]. In some studies, significant correlations between exposure to crystalline silica and risk of death from lung cancer and silicosis have been reported [31Sherson D. Silicosis in the twenty first century 2002; 721-2.-33Steenland K, Mannetje A, Boffetta P, et al. Pooled exposure-response analyses and risk assessment for lung cancer in 10 cohorts of silica-exposed workers: an IARC multicentre study. Cancer Causes Control 2001; 12(9): 773-84. [http://dx.doi.org/10.1023/A:1012214102061] [PMID: 11714104] ]. The results of a prospective study by Chen et al., showed that lung cancer due to exposure to silica was the third most common cause of death among miners in China [34Chen W, Yang J, Chen J, Bruch J. Exposures to silica mixed dust and cohort mortality study in tin mines: Exposure-response analysis and risk assessment of lung cancer. Am J Ind Med 2006; 49(2): 67-76. [http://dx.doi.org/10.1002/ajim.20248] [PMID: 16362950] ]. Finkelstein, in his study, investigated the exposure limit and risk assessment of cancer due to to silica dust, and stated that risk of cancer would be reduced to below 5% if the recommended exposure limit according to NIOSH was a 0.05 milligram per cubic meter [35Finkelstein MM. Silica, silicosis, and lung cancer: a risk assessment. Am J Ind Med 2000; 38(1): 8-18. [http://dx.doi.org/10.1002/1097-0274(200007)38:1<8::AID-AJIM2>3.0.CO;2-#] [PMID: 10861762] ]. Liu et al., in a cohort study, evaluated the risk of cancer-induced mortality from exposure to silica in 24,000 workers over the past 44 years and reported 542 deaths due to lung cancer [36Liu Y, Steenland K, Rong Y, et al. Exposure-response analysis and risk assessment for lung cancer in relationship to silica exposure: A 44-year cohort study of 34,018 workers. Am J Epidemiol 2013; 178(9): 1424-33. [http://dx.doi.org/10.1093/aje/kwt139] [PMID: 24043436] ].